The label of this pilsner really appealed to me – the interesting looking character (apparently someone who actually works at the brewery in fancy dress!) on the front – and the fact the character/beer shares the same name as my schnauzer. Also, the fact that I love Pilsners and like interesting beers from micro breweries meant the bottle was hastily placed in my shopping basket. When I got it home the initial signs were good – on pouring it had a pure and completely clear light golden body with a fluffy white head that gradually faded. The aromas were herby with cereal notes – but a slightly unpleasant metallic whiff was noticeable as well. The taste was OK but nothing special – it was a clean tasting Pilsner – initially light and marginally crisp with toasted/malty cereal flavours and a little dry hay. But did have a slightly off-putting metallic and musty finish – which also followed on from the initial aroma – this lost it some stars. It also wasn’t as carbonated or as crisp as I would hope for. So generally, it’s not too bad – and Pilsner can be a very difficult beer to get right – and I always end up comparing them to the classic Pilsner Urquell. For me if you get close to that you have created a great Pilsner. So to conclude a slightly disappointing 2 star rating – proving you can’t judge a beer by it’s label! 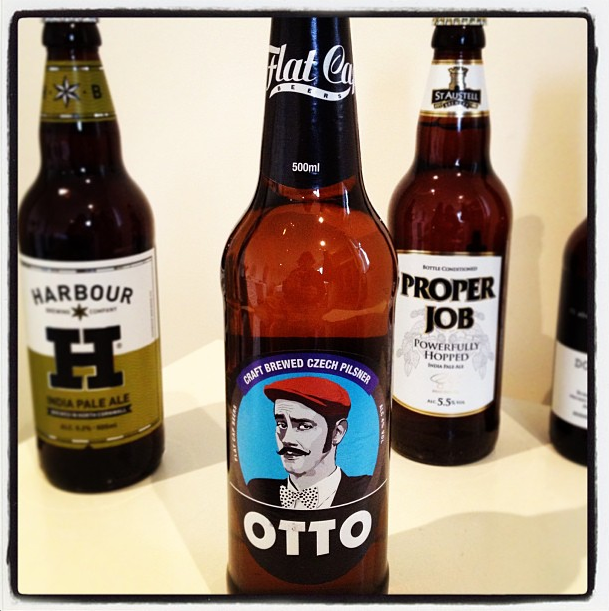 Otto was created by Tomas Lejsek and brewed by Milan Hervert. INGREDIENTS: Bojos and Malz barleys. Sladek, Premiant and Saaz Hops. Czech water and yeast. Otto is reputed to be a direct descendant of Boleslav the Cruel, rumoured to be behind the assassination of St Wenceslas, Duke of Bohemia. Otto trained at the Winkovitch School of Facial Expressions, where he studied under his mentor Mr Spock. He then launched his gambling career as Poker Face Otto and consequently lost the entire family fortune. Broke, bewildered and bamboozled, Otto decided to take up with a rich widow Nina Nineholf who he literally bumped into at the Monaco Grand Prix when she became wedged in the revolving doors of the Casino Café de Paris. Ever resourceful Otto grabbed a large plate of butter from a nearby table to help get her out of her jam. Instead of using the butter as a lubricant Otto used it, along with one of his famous seductive smiles, to lure her out! The freed, perspiring, and greatly grateful Nina threw her arms around Otto, totally enveloping him in her ample chest. For Nina it was love at first sight. For Otto it was a first class ticket to the rest of his life. From casino to casino the pair zigzagged the world in a whirlwind romance that left Nina breathless with love and Otto short of breath…..